Sarah and Patrick are happy. But after her mother's death, Sarah spirals into depression and overdoses on sleeping pills. While Sarah claims it was an accident, her teenage children aren't so sure. Patrick decides they all need a fresh start and he knows just the place, since the idyllic family home where he was raised has recently come up for sale. There's only one catch: for the past fifteen years, it has become infamous as the "Murder House", standing empty after a family was stabbed to death within its walls. Patrick believes they can bring the house back to its former glory, so Sarah, uprooted from everything she knows, pours her energy into painting, gardening, and giving the rotting old structure the warmth of home. But with locals hinting that the house is haunted, the news that the murderer has been paroled, strange writing on the walls, and creepy "gifts" arriving on the doorstep at odd hours, Sarah can't shake the feeling that something just isn't right. Not with the house, not with the town, or even with her own, loving husband – whose stories about his perfect childhood suddenly aren't adding up. Can Sarah uncover the secrets of the Murder House before another family is destroyed? This book took me a while to become engaged. I almost put it down a few different times. This wasn't one of those books that grabs you from the start. Having said that, I still am unclear how I feel about this book. Sarah is a mom of two kids. Her life seems picture perfect. When issues arise, her family picks up and moves to her husband Patrick's old house. He has always said that he had a great childhood and when it becomes known that his family house is available, he enlists Sarah's help in purchasing it. Once the family has moved in to this old home, strange things begin to emerge. Past secrets are hard to keep buried and when they start to surface, it will take all of Sarah's wits to figure out what is really happening. People emerge who aren't who they say they are, stories are told, lies are perpetuated, and ultimately, everyone will have to figure out who is out to get them. This has a lot going on in terms of who is involved and there are some things that I didn't quite understand in the story. However, despite the unnecessary aspects that left me scratching my head, it was a good twist thriller. I do wish that we had been able to see the story from more than Sarah's point of view. I really enjoyed the mystery point of view that was interjected in small snippets. Everyone is suspect and, in the end, everyone has to survive. Vanessa Savage is a graphic designer and illustrator. She has twice been awarded a Writers’ Bursary by Literature Wales, most recently for A Woman in the Dark. She won the Myriad Editions First Crimes competition in 2016 and her work has been highly commended in the Yeovil International Fiction Prize, short listed for the Harry Bowling Prize, and the Caledonia Fiction Prize. She is on the current longlist for the Bath Novel Award. 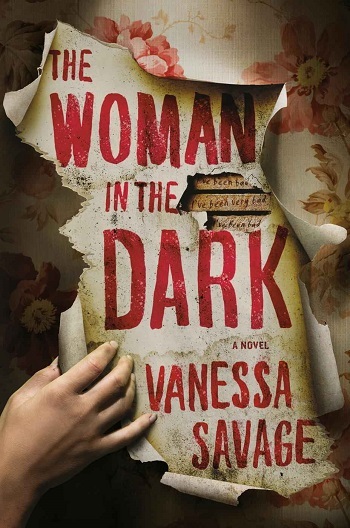 Reviewers on the Wicked Reads Review Team were provided a free copy of The Woman in the Dark by Vanessa Savage to read and review.